Winethropology: Who Doesn't Love Surprises? Frequent readers know that the Old Mission Peninsula in northern Michigan is quickly becoming known for high quality Alsatian white varietal wines - and at very fair prices, too. However, reds from the region have come across as tokens; wines that speak to an obligation to bottle something, anything red. They've tended to be thin and withdrawn. Until now. Am I on Candid Camera? Seriously? This Pinot is from Michigan? No way. It's too damn good. Full house on the nose: fruit, spice, grip, and intrigue. And the palate delivers even more: depth, real fruit expression, and subtle smoke. Wow, wow, wow. Air smooths things out and a friendly mellow character emerges while the juicy tannins hang on. This wine can stand comfortably among California Pinots and not be the least out of place. At $30 it is pricey, for sure, but it is exemplary for what this rising region is capable of. Hands down the best red wine I've had from east of the Mississippi. Oustanding. 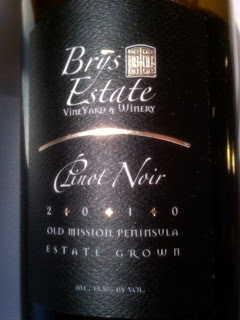 If you think this is good - and I agree, it's excellent - you have to try their Artisan Pinot Noir, a reserve. It's incredible. Thanks for chiming in, Scott. I'll be on the lookout! I have had several of this estate's wines and also used their wine at my wedding. Outstanding reds and a Riesling and Gewurztraminer that is excellent. Anonymous - glad to hear of even more stellar wines from this estate. I'm looking forward to paying them a visit this summer! We are a group of friends that visited Brys Estates early December 2011. We did a tour of the farm and tasted the wine. I was totally impressed with the wine. Very much on par with the great French, New Zealand and South African wines that I love. I agree with you on the Pinot Noir - outstanding. The Cab/Merlo mix is one of my new favorites. Kudo's to Coenie and staff. We will be back again later this year. Thanks, Sandy. I'll have to keep an eye out for the Cab/Merlot blend. Cheers!